Construction is starting on the Snowmass Base Village development, a collaboration between three major players in the mountain resort business: East West Partners, Aspen Skiing Company and KSL Capital Partners. 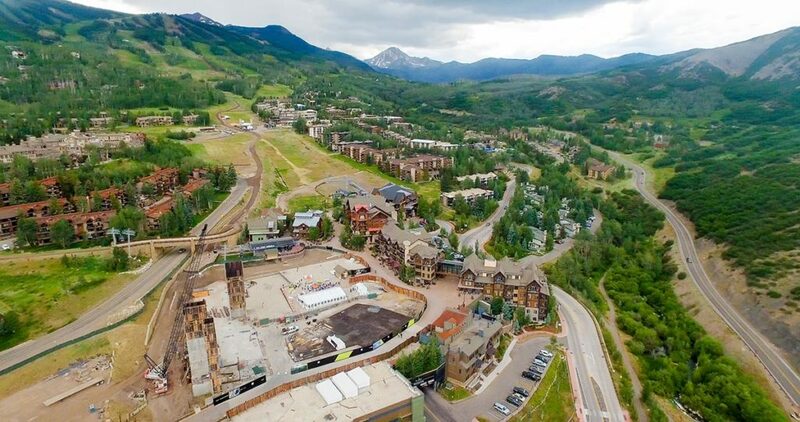 This premier mountain resort development, located at the base of Snowmass Ski Area, is one of the only complete ski base area developments currently underway in North America. “This $600 million, 10-year project will completely transform Snowmass Base Village and add amenities to what is already a world-class ski hill and resort,” said Andy Gunion, Managing Partner for East West Partners-Snowmass, which will be responsible for the day-to-day management of the development. SNOWMASS VILLAGE, Colo., June 15, 2017 – Construction is starting on the Snowmass Base Village development, a collaboration between three major players in the mountain resort business: East West Partners, Aspen Skiing Company and KSL Capital Partners. East West and its partners are all Colorado-based companies. They are building upon previous work done by prior owners, Intrawest and later Related Cos., who completed the first phase of the original Base Village project, approved in 2004. There are currently 90 condos, multiple shops and restaurants and the 150 room Viceroy Hotel in operation as part of that original work. Over the last 15 years, Aspen Skiing Co. has made close to $100 million in on-mountain investments, including the Elk Camp gondola with a beginners area at the top of the lift, a new on-mountain restaurant, additional winter and summer programming and a reconfiguration of the lifts that serve Sam’s Knob and the Big Burn, both original areas of the mountain that opened in 1967. Additional investments on-mountain summer-serving activities are also planned, beginning this summer. “We’re excited to continue this project to its completion and work with the community and the Aspen Skiing Co. to achieve their vision for Snowmass,” Gunion said. The 100-room, 11-residence Limelight Hotel that will include a five-story climbing wall, multi-level fitness center, hot tubs, an indoor/outdoor lounge and restaurant, and a lively après-ski scene, all with spectacular mountain and plaza views. The Limelight Hotel has an expanded lobby area that will serve as a Community Living Room for hotel guests and others who visit and live in Snowmass. The climbing is open to guests and the general public. The Limelight will also host Snowmass Mountain Club, an exclusive 230-member private club with member parking, lockers and lounge space right at the base of the mountain. The mountain-contemporary building was designed by Oz Architecture, with a clean, crisp interior design approach from Stonehill & Taylor. A central public events plaza that will serve as the community’s gathering space with an ice-skating rink in the winter and events lawn during summer months, as well as fire pits, children’s pop-up fountains and other community amenities. The plaza was designed by Oz Architecture and StudioINSITE. A residential condominium building adjacent to the Plaza and Elk Camp Gondola with three residences and an Aspen Skiing Co. ski and outfitters shop. The building was designed by Oz Architecture, with interior design by The Ranch House. The Discovery Center, a public building that is anticipated to include a number of interactive activities for families and children. Programming for the Discovery Center is being contemplated around the discovery of Ice Age fossils found at nearby Ziegler reservoir that captured the community’s and world’s attention. It is being designed by Harry Teague Architects. This fall, construction will commence on two additional residential buildings — 41 condominiums in all. These buildings include ground floor commercial space and will house the Base Village Welcome Center. Both buildings are being designed by 4240 Architecture with interior design by Styleworks. Notably, the buildings are being designed by a number of different architecture/interior design teams, moving away from the more uniform resort village designs that have been prevalent over the last two decades. Base Village will create a seamless, livable space that celebrates the surrounding mountain landscape and outdoor lifestyles of Snowmass Village. The newly designed buildings will create a Mountain Contemporary Village that will highlight both comfort and style, using natural materials and timber accents throughout that make them complementary to the overall development and mountain setting. It will be architecturally similar to the contemporary high-end homes that have become prevalent at resorts around the country over the last decade. Snowmass Village and Snowmass Ski Area hold the unique place among resorts in that it is building a new village at it’s base 50 years after opening. The resort is celebrating its first 50 years as it adds a new center filled with hotel rooms, residences and commercial space. A renowned winter playground and vibrant mountain community just 8 miles from downtown Aspen, Snowmass Ski Area consistently ranks as one of the best ski and snowboard hills in the world. In addition to unmatched natural beauty and over 300 sunny days a year, Snowmass Ski Area offers guests 3,332 acres of multi-level terrain and boasts the second largest vertical drop in the United States. 95% ski-in/ski-out lodging, 37 restaurants, numerous shops and boutiques, a bounty of off-piste activities, and a friendly, small town feel beckon visitors year-round. For more information and a complete calendar of events and activities, please visit: www.gosnowmass.com.